FIGURE 5.2 Left-lateral view of pelvic bones in relation to acetabulum and proximal end of femur for typical saurischian (left) and ornithischian (right) hips in dinosaurs. in the early twentieth century by Friedrich von Huene (Chapter 3). 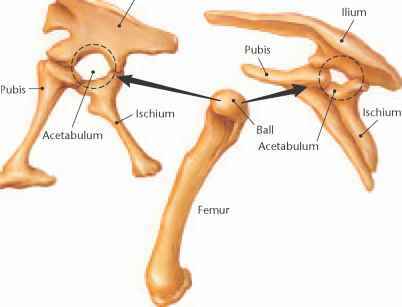 The differentiation lies essentially in the arrangement of the hip bones (ischium, ilium, and pubis) in a dinosaur pelvis (Fig. 5.2). In both clades, the ilium extends laterally to both sides from the axis of the body and dorsal to the ischium and pubis. The pubis in saurischians points anteriorly (cranially), whereas in ornithischians it points posteriorly (caudally) and joins with the ischium so that it is ventral to the ischium. The ischium in both saurischians and ornithischians is posteroventral, in that it points toward the rear of the animal and is closer to its belly than its back. ■ Evolutionary history of dinosaurs (Chapters 6 and 15). Hip bones are found not only in land-dwelling vertebrate animals of the geologic past, but also in those existing today. As a result, they represent a recurrent structure as an adaptation to supporting movement in terrestrial environments (Chapter 10). 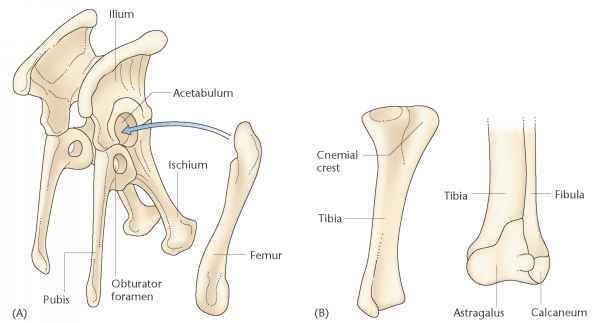 The hip bones join laterally to form an open hole on each side called the acetabulum, which is articulated with the anterior end of the femur (Fig. 5.2). The fact that the medial wall of a dinosaur acetabulum is open enough that a rope can be threaded through it is one of the characters of dinosaurs that differentiate them from their ancestors. The articulation of the head of the femur with the acetab-ulum also contributes to another dinosaurian trait, a shelf built into the inner wall of the ilium that accommodates the ball-like projection of the femur. This adaptation is one of the main indicators that dinosaurs walked upright with their legs directly underneath their bodies, instead of crawling with their limbs sprawled out to the sides like large lizards (Chapters 1 and 14).